Specifically discourage the use of cellphones and hands-free devices while driving. To this end, the NSC has published a number of interesting and shocking statistics regarding distracted driving-related car accidents in the U.S. In honor of Distracted Driving Awareness Month, we will highlight some of these – as well as some other critical distracted driving statistics – to support this effort to help make the roadways safer for all motorists. In honor of the Distracted Driving Awareness Month, here are some distracted driving statistics that reveal how often this negligence contributes to accidents. 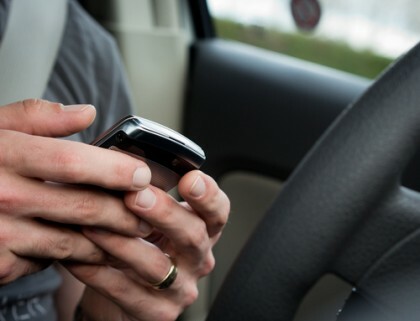 While about 90 percent of all car accidents are caused by some type of human error, the use of cellphones and hands-free devices (one of the most common forms of distracted driving) reportedly contributes to approximately 26 percent of all motor vehicle accidents that occur in the U.S. each year. The brain reportedly loses the ability to process about 1/3 of the images surrounding vehicles when people are talking on cellphones and are using hands-free devices. In turn, this can cause drivers to miss up to half of all of the important driving cues they need to process when they are trying to talk on phones while driving. When drivers try to text while driving, their risk of getting into a car accident increases by approximately 23 percent. These statistics have been put together by the National Safety Council (NSC), as well as by the National Highway Traffic Safety Administration, the Insurance Institute for Highway Safety and other reputable agencies. Texting while driving is a factor in as many as 1.6 million motor vehicle accidents that occur in the U.S. each year. Drivers who are texting are, on average, about 6 times more likely than drunk drivers to be involved in car accidents. The degree of impairment caused by texting while driving can be likened to driving after having consumed four alcoholic beverages. When drivers are using their cellphones while driving, their reaction times to stepping on the brakes of their vehicle are slowed down by as much as 18 percent. At any given time during the day, as many as 800,000 motorists in the U.S. are using their cellphones while behind the wheel of their vehicles. You can support the NSC’s Distracted Driving Awareness Month by putting down cellphones while driving and spreading the word about this campaign. Put down your cellphone and turn off your hands-free device while driving. Talk to teen drivers in your household about the dangers of distracted driving. Take the pledge on the NSC’s website. Spread the word about this campaign. The NSC offers various materials for download for people who want to post information about this campaign in their workplace’s lunch room, community centers or any other place to help spread the word about Distracted Driving Awareness Month. If you have been hurt in a car accident that was caused by a distracted or negligent driver, the Portland car accident attorneys at the Savage Law Firm are here to be aggressive advocates for you and your rights to compensation. Since 1977, our dedicated legal professionals have been devoted to standing up for victims’ rights, holding negligent drivers responsible for victims’ injuries and working tirelessly to help motor vehicle accident victims obtain the compensation and justice they deserve. Helping you recover from the financial setbacks caused by car accidents is one of our primary goals. Our Portland accident attorneys encourage you to learn more about your rights and case by setting up a free initial consult. We represent clients in communities in both Oregon and Washington from our offices in Portland and Seattle.